This has been quite an exciting year for Daemons & Deathrays! It marks me expanding my site content through new ideas and concepts. It also will mark me making the leap to digital distribution and sales! *fingers crossed! * Above all, it’s the third time I’ve participated in the Blog Carnival. In this case, spearheading this month’s theme! On that note, the theme for this month is “Super Science & Sorcery.” In other words, science fantasy. This hybrid genre embodies a mixture of motifs found in both science fiction and fantasy fiction. The origins of the genre stem from a time when speculative fiction was significantly less concrete in its terminology. On one hand, you had harder science fiction typically written by people in directly scientific fields of study. On the other hand, you had lighter and pulpier science fiction. While they explored a variety of themes found in the genre, they weren’t as concerned with creating a world cemented in tested theories or making it feel exactly like our own world. These range from Buck Rogers radio serials and b-grade midnight movies to fantastical epic stories like Star Wars and The Masters of the Universe. In terms of tabletop hobbies, the concept of science-fantasy is as old as the grand parent of roleplaying games itself! David Arneson’s Blackmoor made homages to aliens, high technology and even Star Trek. Gary Gygax brought a spacefaring vessel (likely from Metamorphosis Alpha) into the world of Oerth via Expedition to Barrier Peaks. The Post-Apocalyptic wastes of Gamma World and the western frontier of Boot Hill had options to bring strange gizmos across the planes via the Advanced D&D DM’s Guide. Gygax’s friend and co-founder of TSR, Don Kaye, made a character that transported to Boot Hill and learned the art of the shootist. Upon returning to Greyhawk, he was decked out in cliche cowboy gear and sixguns. After Kaye’s passing, Gygax honored his character as a minor deity of magical technology. During 2E’s run, Dragon Magazine had a plot involving invasive evil robots called “Sheens”, as well as an adventure called “Tales of the Comet” with a similar theme. As the years continued, we saw a few steampunk articles for Dragon magazine, the D20 Modern roleplaying game, Gamma World revisions for new editions, Dragonstar, 3rd Party settings like Amethyst, among countless other genre mashups for the game. With that, the concept of Science-Fantasy within the realm of Dungeons & Dragons (and roleplaying games in general) is far from new and far from over. Beyond the realms of D&D, we’ve all sorts of works arise over the years: Warhammer 40K, Titansgrave, Shadowrun, Skyrealms of Jorune, RIFTS, the list goes on! So, you may be wondering where you all fit into this strange theme? For this month, I’m asking you to share any Science-Fantasy RPG goodness you have with me! Stories, homebrew, etc! Please, comment down below with a link to your creations. Despite the D&D-centric nature of this blog, I encourage you to explore any RPG game or story within the realms of science-fantasy that works for you. At the end of the month, I’ll do a round up post involving all of this month’s contributions. Here’s to a successful month of mutants, magitech, machine men and more! For more information on the RPG Blog Carnival, please visit here. The lost queen of the dream realm, Antumbra is considered the good answer to Penumbra’s reign of terror. Unfortunately, Punembra is responsible for her disappearance. What exactly happened to her remains a mystery, but it’s possible that she was slain and her powers were stolen. Considering Penumbra isn’t any stronger and remains angry towards those who bring up her name, this is likely not the case. Many who treat her as a divine source of inspiration claim that her essence lingers somewhere in the boundless universe. However, the exact locations is unknown. Those who claim to know are more than likely liars or out of their minds. To many, she is not only a protector of good dreams and sleep, but of good health as a whole. For aeons, many traversed the strange lands of dream for her legendary healing talents. Illnesses of body, mind and soul; all of which posed little issue to her. Granted, her neutrality towards material plane politics and faiths caused almost as many to turn away from her, as she had little interest in spurring on conflict. Some travelers simply sought out advice in hopes of living out their greatest dreams. As a master of dreams, she came to understand the aspirations of many sleepers. This has lead to many cults and covenants dedicated to her strange fey power. However, she feared the extra attention might bring the ire and jealousy of her unhinged brother. In an effort to prevent this, she did all she could to protect him and ensure his wellness. Her personality was a trusting one, as she saw good in all things. Perhaps one of her greatest strengths was also a glaring weakness. Her corrupt brother exploited her nature in a time of his own weakness. He had nearly been crushed by a rival court. As a family member of the same fey court, she was obligated to aid him. Upon being helped back to normal, he seized the chance to banish her. Knowledge beyond that action is all but lost. All that is known is the realm of dreams was taken over by him and twisted into a vile hellscape of his design. Wherever Altumbra is, her control over the realm is all but severed. Author’s Note: One of my good friends brought to my attention that Penumbra had a sister in his backstory and there was a lot of unused potential in her story. Even though she was banished, whose to say the players can’t find her and make plans from there? With that, I decided to expand upon Antumbra a bit more. Hope you enjoy. Reptilians, Reptoids, Lizardmen, Reptile folk, Scaled Ones, Scalies. A wide variety of names describe these creatures. Likewise, a variety of stories detail these creatures. Whether it’s tales of mysterious scaled beings skulking in tropical rain forests or desert marauders that carry poisoned weapons, tall tales travel quickly… perhaps faster than the lizard people themselves. No matter what stories ring true, the lizardfolk are a resourceful and enduring race; one that has faced immense hardships going back eons, perhaps before the existence of the “typical” races of today. Many choose to dwell within marshy or tropical climates, as it suites their cold blood well. Others have expanded out to regions that are typically less humid and warm on the average. These brave souls are typically adventurers or are merely curious about climates beyond what they’re accustomed to. Some have reported brave souls traveling to frigid areas. For lizardfolk who don’t come incredibly prepared, such a journey is suicide. The purpose of these journeys varies as one would expect. Some seek to expand their territory, others seek new lives. The allure of fame, fortune, endless possibilities; it’s just as enticing to lizard kind as it is to the humanoids. In ages past, an advanced society of the scaled kind ventured beyond the stars and into the planes beyond. Thus were born epics of their people coming into conflict with fiendish underworld dwellers (with traitors switching sides in the process), walking mechanical shapes, fair-like celestials and other oddities. One account detailed a city ruled by a series of squirrels wearing a headdress, a robe, and a ring of levitation; a cruel over-deity of sorts that smites all in her way. According to this lore, many a wandering lizardfolk have met their end at the hand of such a monster. However, the remainder of this famed troupe had returned with glorious anecdotes of cosmic adventure. Tales of their legendary glory circulate among storytellers, medicine men, bards and even poets among the lizardfolk. Such plots and campaigns are toted as proof that the lizardfolk are far braver and more intelligent than many rivals give them credit for. No one is entirely sure where the lizardfolk came from, not even themselves! For ages, shamans and storytellers have fabricated their own tales, mostly for amusement. Some say that they descended from a race of ancients that were pushed below the world in ancient times, only to rise up and claim their own overworld turf. Others say they were once “fleshy ones”, or perhaps actual lizards, transformed by incredible magical powers. To others, they have just always been, much like the other races of the material realm. Origin story never really concerned many of the lizardfolk nations and tribes anyway. Some assume that the ancients that traveled the planes weren’t lizardfolk, but mythical beings that gave scaled kind the power of sentience. In many religions, this syncs up with the belief that powerful entities known as the Ancients are the true bringers of life and will one day awaken from their tombs in the center of the world, where they shall unite all life under the scaled ones. Beliefs in deep gods as well as the strange myths they tote as their origin stories only help to hinder their reputation. Many view them as a strange oddity at best, foul beasts that must be vanquished at worst. In many civilizations, the scaled ones are shunned as upright walking beasts incapable of grasping social graces and the nuances of culture. Even in more metropolitan lands, there comes the base assumption that such creatures are oafish and think through instinct rather than rationality. As such, traveling lizardfolk are often relegated to demeaning tasks. This is mostly because most people are quite simply too afraid to enter a land ruled by the lizard folk. To those who have tried to understand their ways, their society is just as complex and industrious as any other… and likely as flawed. Much of lizardfolk society is ruled under a strict patriarchal code where Lizard Kings are respected with an almost divine significance. In times of progress and advancement, the cultures tend to flourish under such reign. In times of stagnation and regression, the opposite occurs. Despite what one would assume, lizard women are treated quite well in such a society, even if they don’t hold positions of power. However, such a tradition has worked well for these people through the ages, even if many outsider eyes view them as overtly sexist and backwards to much of the world around them. The aforementioned deep gods make up much of the common religions, while existing as cults in more mixed/non-lizardfolk society. No one is certain if such deities exist, but among the lizardfolk, they are all powerful and all existent. For many high priests, they see the entombed giants as protectors who watch over the scaled ones while they sleep. Truth behind this is uncertain, but it might have some basis to theories that they once lived in the center of the planet themselves. However, members of the scaled church will refuse to answer more on this. AUTHOR’S NOTE: I haven’t done a beastly race, let alone any race in a while. This one was requested by a blogger on my Tumblr page a looooong time ago. Whoever you are, I just want you to know that you were never forgotten! I just get busy is all. Anyway, here’s my take on the Lizardfolk. Sure, my fluff exists as a parallel to my gnoll post from many months back, but that need not be a bad thing. Come to the Dreamlands! It’s like Inception, but less convoluted! Some arcanists travel over countless planes of power and thought throughout the multiverse. Infinite realms within these dimensions hold infinite possibilities. Some planes are manifestations of ideas come to life. The Plane of Dreams is, quite literally, one such plane. A realm where all matters of the mind run wild dwells, the traveler moves through this surreal realm in a semi-conscious state of being. Those who stay too long notice their magic is directly effected, as dream stuff changed the fabric of their being. Their ability to sleep is enhanced, visions in their dreams are more vivid and a piece of that planar power is sometimes inherited by the next of kin… or even themselves. Thus is the origin of the Dreams bloodline. Dream Sorcerers sculpt their powers from the subconscious mind, creating incredible mystical shapes and forms. Some craft whole realities from the surreal images of the resting mind. Others are content with exploring the Dreamlands in their entirety. Some embark on dream quests, fighting creatures of dream stuff and more corporeal things like the Mi-Go. To some, the potential to rival the dark dream denizens of Dal’Quar in power is all too tempting. Some decide to forgo an absolutely mystical route in favor of the sciences, examining the nature of the mind itself and the effects of the sub-conscious. Those who maximize such powers to their benefit, no matter the motivation, are a force to be trifled with. Of course, Powers of the Dreaming are not to be taken likely. Those who abuse them could very well lose all grip on the difference between dream and reality. Author’s Notes: I didn’t like how the original draft came out, it felt very un-sorcerer like… so I’m gonna fix that to the best of my ability. In short, some the abilities felt a bit dry; cut right out of some of my other work. Not to mention, I looked over the negative feedback the Favored Soul received from Unearthed Arcana, especially in regards to expanded spell lists. In the end, I felt like it needed some modification. Beyond the mechanical, I wanted to expand on my Night Terror bloodline thematically too! I made it more general after reading up on all sorts of inspirations: H.P. Lovecraft’s dreamlands, dreams and their connection to the faerie folk, the Changeling setting from World of Darkness, various cultural looks at dreaming and divination and many more things! No matter, here’s my update of the “Night Terror Bloodline” from Halloween 2015. The Elemental planes contain forces that embody raw and natural powers. The denizens of these realms equally represent those forces. The four prime planes represent basic elements that transcend the multiverse. All around, these beings tend to be neutral in nature or unable to comprehend alignment as a whole. However, the multiverse is vast and has methods of warping the essence of the planes themselves. The Elemental Planes are no different in this regard. One such example of this is the Demiplanes of Dread, known to some as “Ravenloft.” This dark prison dimension is ruled by a mysterious power called “The Mists.” It is unknown what such entities are, in a similar vein as Sigil’s protector known as “The Lady of Pain.” When the mists touch upon an elemental plane, they forge a strange demiplane copy that fits in with the darkness and despair of the Dread realm. The so-called “Dread Elementals” are the results of such sinister mingling. These fallen elementals are empowered by same wickedness that spurs the defiled darklords and depraved denizens onward. Unlike traditional elementals, these shadowy doubles are openly malicious and will appease the mists in one way or another. This is because they hate what they are. The mists have transformed them into sick minions for their bidding, giving them the slightest inkling of awareness to render them mad. In their hatred, they lash at those who extend their mockery of an existence. Other times, they target those who dare to oppose either their goals or the goals of the dark powers. Monstrous Variants – More Zombies! Zombies, disposable minions of the undead. Alone, these near mindless shambling corpses pose little threat. But woe to those who get too close to a horde of them, for they risk being torn apart by a walking mob of death. Zombies come in many stocks, destroying all that they encounter. In some instances, a single living dead can spell disaster for anything it comes into direct contact with. Such zombies are loaded with corruptive pathogens that create more walking dead when their victims fall. Others are brought back through a mixture of divine rites and deadly neurotoxins, forced to work off the sins they committed in their past lives. Others are the foul manifestations of negative energies, twisted and corrupted for likely malicious purpose. No matter the origin, the zombie is a creature synonymous with absolute horror. Its shambling remains exist to cause destruction and misery. Only by slaying them can you hope to put their miserable souls to rest. 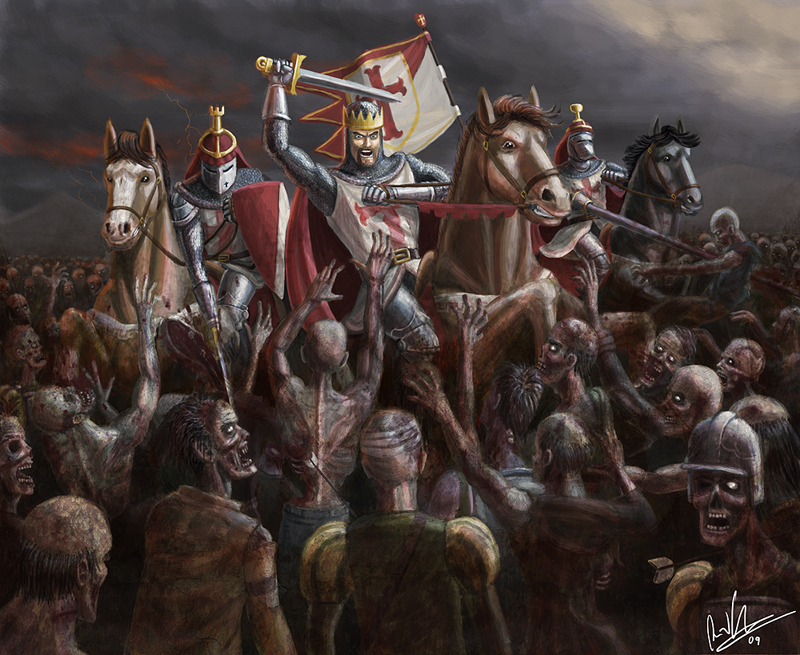 Sometimes that is not enough; consecration, utter annihilation, reburying the remains and burning everything are typical ways to rid the undead plague. Sometimes, pushing the problem elsewhere is the only action that can be taken. Author’s Notes: Zombies, for when you run out of ideas and need a horror monster on the spot! But in all seriousness, I love zombies in all sorts of games, even though they are typically the result of a creative dry spell. That said, building zombies is always fun, so I wanted to make some monstrous variants as examples of you can make legions of living dead at the disposal of necromantic masters. Also, be on the look out for the finale of my Gothic & Gaslamp theme!